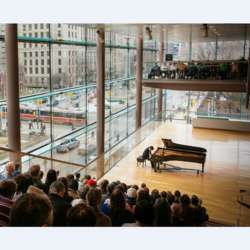 You must be a member of the Toronto Arts & Culture Group to attend this activity. Would you like to join this group? This is for those who want to add some music to their Thursday during lunch hour! If someone is willing to gather the group, please let me know. I work out of downtown Toronto, so I won't be able to make it sadly, but found it worth sharing with our group. The Payadora Tango Ensemble performs an expansive repertoire that draws from the height of Buenos Aires’ Tango tradition and is known for their technical virtuosity, playful spontaneity, and rhythmic vitality. They perform works from their latest album Volando, which means “flying” and was inspired by a beautiful sunset in the clouds as seen from a flight home by violinist Rebekah Wolkstein.